Last October, I ran into Pete Holland of the Floating Rum Shack at the Berlin Rum Fest (literally – I tripped and nearly fell into his shelf of rums, and he saved them by interposing himself so they would not be damaged, even if I was). 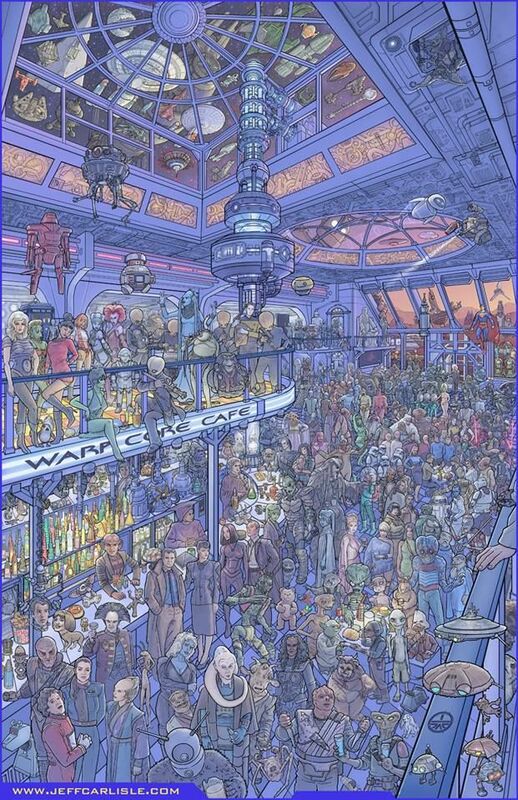 Although we, as long-existing rum bloggers, knew of each other — all of us know each other in the Oasis — we had only met once before, so I bee-lined over to see what he was doing. It turned out he was stewarding the line of rums from the cheekily named “That Boutique-y Rum Company” (hereinafter referred to as TBRC) a division of Atom Brands, which in turn runs the Master of Malt online spirits shop (and which also self releases and self reviews the Cornelius Ampleforth rum, if you recall). Pete steadied me, indicated the whole range on display, and asked what I wanted to try. 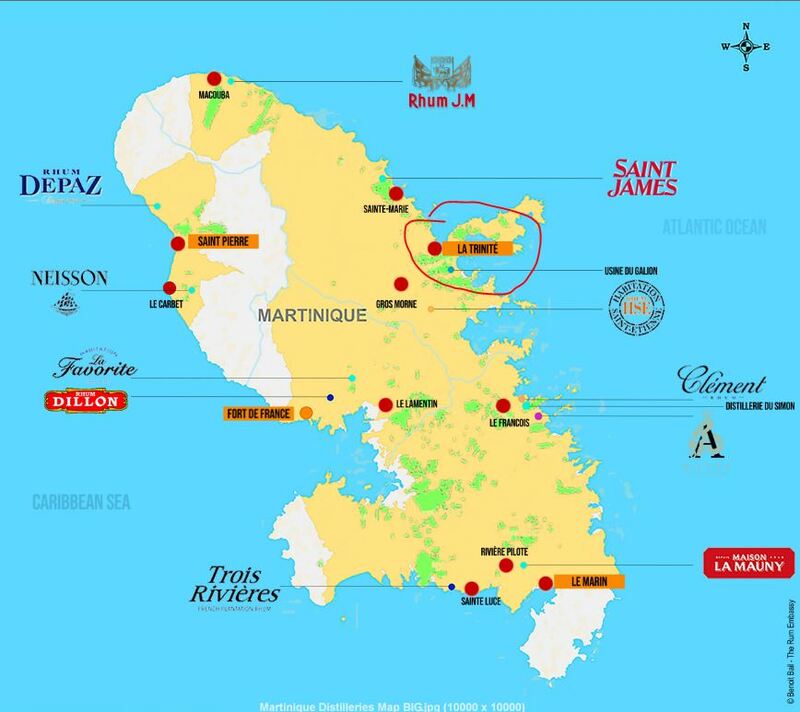 I looked at all the familiar countries, ignoring most, looking for the unusual, not the standard – something the brand has done that takes us into new territory to awe and enthuse (the way Foursquare has done with the ECS, L’Espirt is doing with its 2019 whites, Rum Nation did with the Supreme Lords, and Velier did with…well, just about everything). These days, I want something weird, off-kilter, new, exciting, different – and still tasty. Now you could tell that Pete, who is a consultant for the company, not an ambassador, really liked pretty much everything, which is why he kept his glass on the go the entire time from different bottles (under the pretext of helping out the bright-eyed but inexperienced rum chums swirling around the booth). “Yes mon, me drinkin’ de same rum dat me showin’ you, so it gotta be good,” you could easily imagining him saying as he avoided braining passers-by with his tasting glass using graceful moves of the arm, never spilling a drop. So I was curious what his own favourite was, shorn of the need to sell anything to me. He hesitated, seeing the trap, but then grinned, sipped again, and then pointed at a bottle off to the side, sharing the same colour scheme as the Enmore and the Bellevue. It was from O Reizinho, a Madeiran outfit of which I knew nothing except that it was from Madeira (which, as an aside, is an EU-recognized agricole producer). “That one.” And without losing his glass in the one hand, he proceeded to pour me a shot with the other, hefty enough to render me catatonic, then stood back to observe the results (much the way The Sage had done years back when I had tried my first clairin, the Sajous). Strictly speaking, the rum is not that strong – “only” 49.7%, which is a couple of whiskers away from standard. 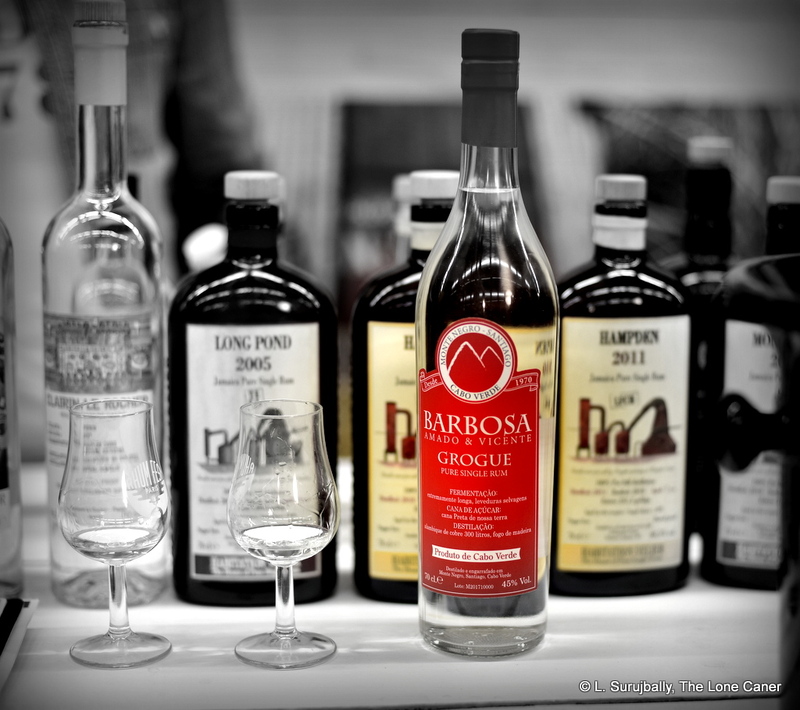 It was made in Madeira, which intrigued me, as I really enjoyed the Engenho Novo rums made by Hinton and Rum Nation; and it was a pot still rum, an unaged rum, and a “white,” all pluses in my book. And anyway, how could you not want to sample a rum named “The Kinglet”? I know I did, and not just because of his recommendation. It didn’t disappoint, starting out with a firm aroma of salt and wax, very powerful. Earth mustiness, cardboard, loam, olives, bags of salt. Like a clairin, but softer. Fresh and deep, edging “crisp” by a whisker, and while the herbal notes of dill and grass and fresh sugar cane sap were there, they were not so much dominant as coexistent with the other notes mentioned before. A really outstanding set of aromas, I thought, with an excellent balancing act carried off in fine style. And the taste, the mouthfeel – wow, really nice. Warm, sweet, dry and fruity, with raspberries, bananas, pineapple, papaya, salt olives all dancing their way across the tongue, without any sharp nastiness to spoil the enjoyment: I like rums north of 60%, of course, but there was no fault to be found in the strength that was chosen here because even at that low power, it thrummed across the palate and still managed to provide a clear demo of all the proper notes. Excellent sipping dram as long as you’re okay with a not-so-furious amalgamation of sweet-brine-soya-miso-soup admixture. If it faltered some, it was on the finish – and for the same reason the nose and palate were so good, i.e., the muted strength. That didn’t invalidate it (to me), and it was pleasant, sweet, soft, warm, firm and fruity, with just a little edge carrying over to complete the experience. 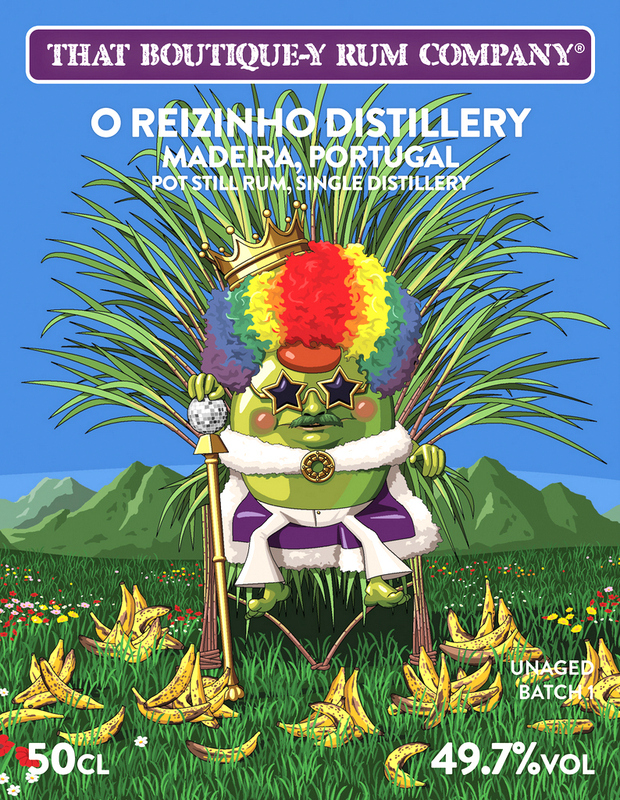 O Reizinho means “Little King” or “Kinglet” depending on whose translator you use, and is a small distillery perched on a hillside on Madeira’s east coast by Santa Cruz. 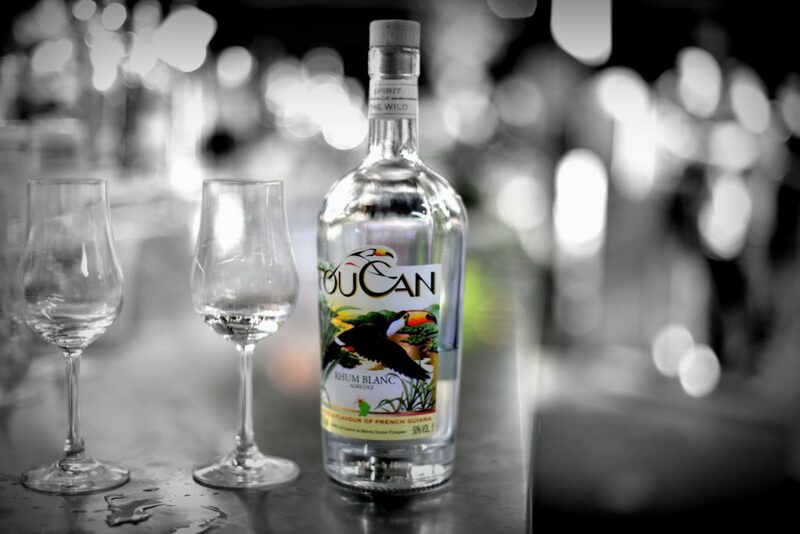 It is run by Joao Pedro Ferreira, who returned from a sojourn in South Africa some years back to go into the rum business with his father. They source cane locally, crushing it in one pass only (no messing around with a 2nd pass or adding water) and then let it stand in a week-long fermentation period. Then it’s run through a wood-fired steam-injected pot still, which on a good day can provide a dozen runs. 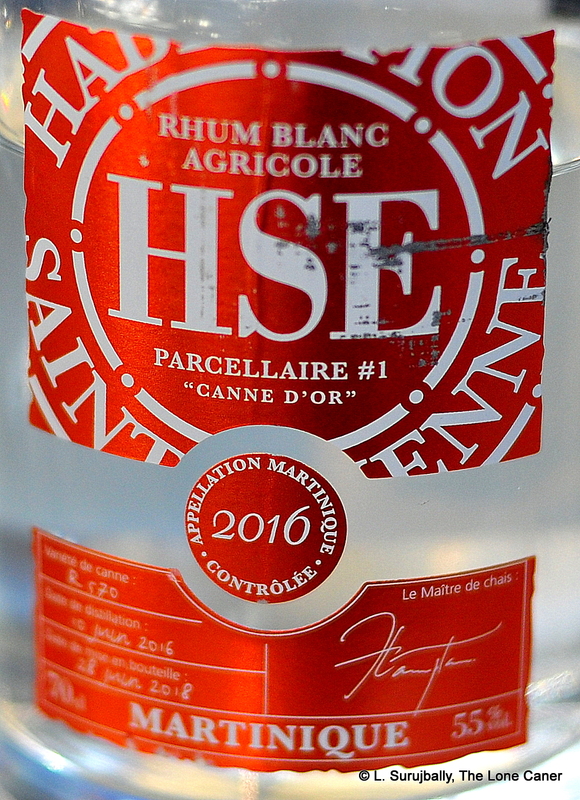 So French island nomenclature notwithstanding, this is an agricole spirit, and it adheres to all the markers of the cane juice rhums, while providing its own special filip to the style. Initially, to get things going for the first release, TBRC bought some of those rums from a broker (Main Rum) the way so many new and old independents did and do. 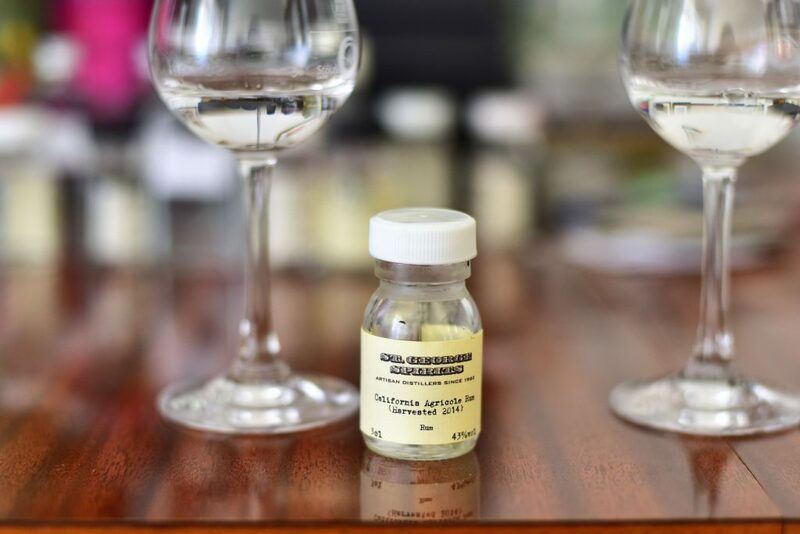 But this one was bought direct from O Reizinho, and the intention in the future is to continue to do so, and to go with both aged and unaged products from this tiny distillery. If they keep bottling — and TBRC keeps issuing — juice as fine as this, then all I can say is that the future is a bright one for them both, and I look forward to trying as much as I can from TBRC’s extended range of rums generally, and O Reizinho specifically. They’ve enthused me that much with just this one rum. 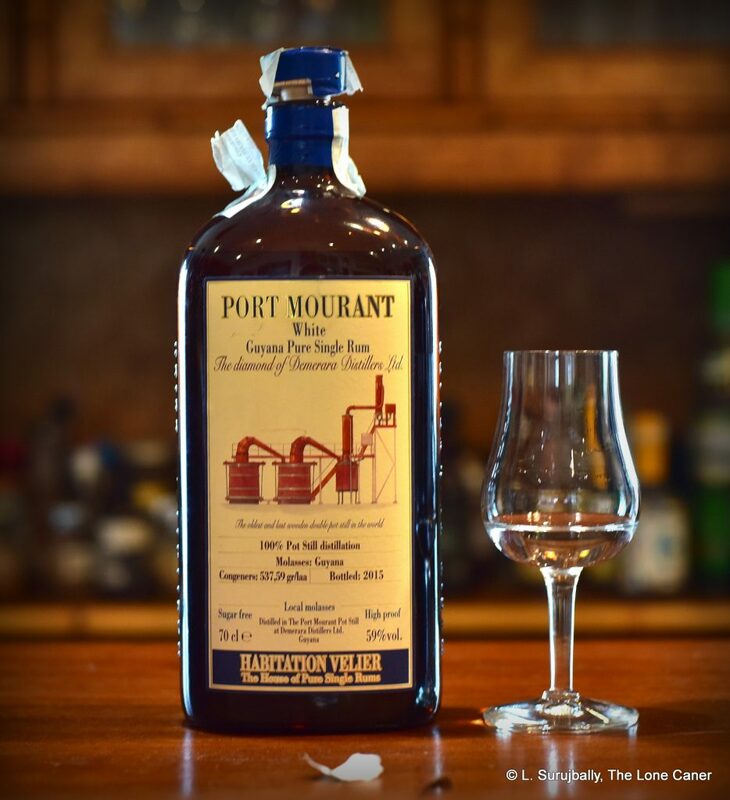 Posted by Ruminsky at 4:43 am	Agricoles, Europe, Madeira, Pot Still Rums, Rum Reviews by Country, Rum Reviews by Maker, Rum Reviews by Type, That Boutique-y Rum Co., Unaged Rums, White Rums Tagged with: Agricole Rhums, O Reizinho, Pot Still Rums, Rhum Agricole Blanc, Rums from Europe, Rums from Madeira, Rums from Portugal, That Boutique-y Rum Co.
Just as we don’t see Americans making too many full proof rums, it’s also hard to see them making true agricoles, especially since the term is so tightly bound up with the spirits of the French islands. 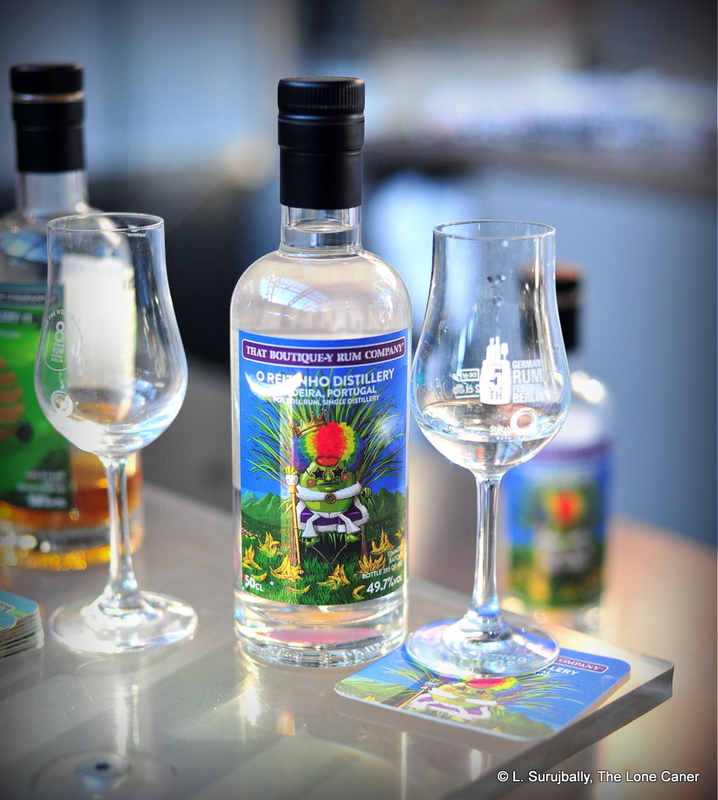 Agricole, let it be remembered, is the French term for agricultural rums made from pure sugar cane juice, and called such to distinguish them (not without a little Gallic disdain, to be sure) from traditionnels, or traditional rums, which are made from molasses, a by product of the sugar making process. 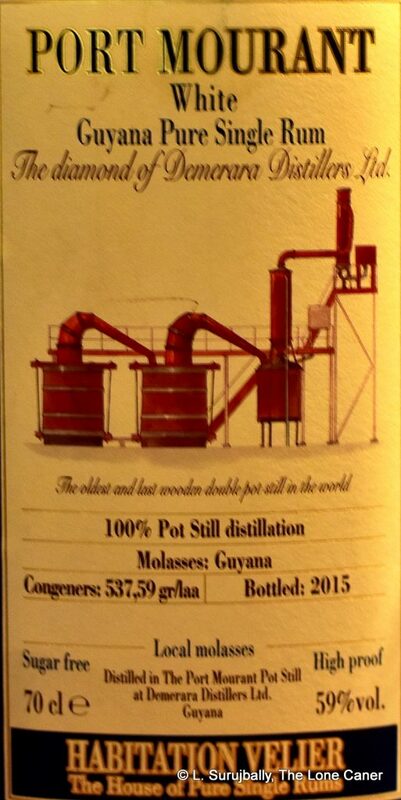 For the most part, having much to do with the finances, molasses rums are much preferred by producers, because the issues of storage and spoilage which afflicts cane juice (it can go bad in just a few days) – that’s one reason why agricoles are closely associated with actual sugar estates with a distillery nearby – not always easy in a country the size of the USA where there is much greater separation between the two. In the case of St. George’s, a 1982-established California distillery much better known for its gins, absinthes, vodkas and whiskies, they get their fresh cut cane from Imperial Valley just to the east of San Diego along the Mexican border, and when a load comes in, they crush it immediately, add the yeast and ferment (duration unknown) before running it through a pot still (Josh Miller spoke of a hybrid pot/column still when he visited them in 2013 but St. George’s wrote to me and said “pot” for sure). The resultant spirit is rested for a short while in stainless steel tanks, with some being drawn off to age for a few years in oak, the rest being bottled at 43%. My version was based on the 2014 harvest according to the sample info, and was therefore issued in that year. On the nose…oy! What was this? Vegetable soup, or (take your pick) meatballs, dumplings, dim sum or spring rolls…that kind of thing. Also vinegar, soy, pickles and fish sauce, a pot of brine and what felt like three bags of olives. Behind all that is a sharp edge, like a red wine gone off somehow, and whatever fruits there were took a reluctant step back – so much so that the first thoughts that ran through my mind as I smelled the rum was it was a low rent clairin that tried for the brass ring but ran out of steam. Still – nice. Adventurous. Different. I like that in a white rum. Alas, the palate, after that jarringly original overture that so piqued my interest, seemed to go to sleep, a function of the 43% ABV maybe, and a reminder that pungent rums like unaged whites don’t always succeed when dialled down to a somnolent standard strength. Still, it did wake up after I ignored it for a bit, and gave a twitch of sugar water and watermelons, fresh-cut pears, vanilla and citrus, very light and very pleasant. Yes there was a sort of creaminess and black bread, behind which lurked the brine and olives (lots of both), but the rum seemed to have problems deciding whether it wanted to be a crowd pleaser or something truly original such as the nose had promised, and the finish – long, dry, salty, lightly fruity, sweetly watery – just followed the palate into a docile conclusion. Truth is, the whole experience was schizophrenic – it started off with fire and smoke and major f**ken attitude, then just lost its mojo and sagged against the wall. For all the unbalanced helping of crazy with which it opened, I liked that off-kilter nose a lot better than everything that followed because it showed all the potential that failed to be realized later on. An unaged pot-still white should be a little off-base – anything else and you have a mere cocktail ingredient and there are already enough of those around. That said, it’s not that I actively disliked the rum…just that I felt there was nothing serious here: nothing badass that dared to offend…or inspire (say what you will about the TECC and TECA rums from NRJ and their barking-mad taste profiles, they had real balles). So, at end, it’s a light alcohol with great promise (how it smelled) and too little follow-through (palate and finish). Cyril of DuRhum reviewed this same edition, scored it at 77 and provided some great details on the company, and it was tasty enough to make Josh Miller wax rhapsodic in 2013 when he visited the place, tried some and recommended it highly both by itself and in a Ti-punch (you need to read his 10/10 scored review as a serious counterpoint to mine and Cyril’s) – but here I have to be somewhat less enthusiastic based on my own tasting five years down the road. Neither this rum or its lightly aged brother is listed on the St. George’s website. When I touched base with them, they sadly informed me that because of the difficulty of acquiring fresh cane, they have ceased rum production for “a number of years,” though they remain on the lookout for new and stable sources. For the moment, they’re not making any. An irrelevant aside to this review is that I inadvertently tried it twice: once in 2017 based on a sample sent to me (totally blind) by John Go; and the second time in 2018, this time one I bought on a whim. In both cases my tasting notes were practically identical, and so was my score. I think this is an innovative, intriguing rum from the US which can and should be tried if possible. It was the words “Grand Arôme” that caught my eye: I knew that term. “Galion”, which I seemed to remember but didn’t, quite. And “Martinique,” hardly seeming to go with either. It had no brothers and sisters to its left and right on the shelf, which, in a shop stocking rows and rows of Plantations, Rum Nation, BBR, Saint James, Bally, HSE, Dillon, Neisson and all the others, struck me as strange (that and the rather “poor-relation-from-the-backcountry” cheap label and tinfoil cap). What on earth was this thing? I bought it on a whim and cracked it in the company of some other agricoles that night and did not one lick of research until after it was done: that was probably the right decision, going in blind like that, because here is a rum which lurks behind the Martinique canon the same way the bottle did on that shelf, and it’s rare enough these days to find a rum you didn’t know existed, especially from an island with so many different rhums of its own that are well known. Rums and rhums titled “Grand Arôme” are high-ester products much associated with French island rhums in general (Reunion Island’s Savanna HERR in particular) and have a lot in common with the New Wave of Jamaican rums we’re currently seeing from Hampden, Worthy Park and others, with their own classification titles like Plummer, Wedderburn and Continental Flavoured. 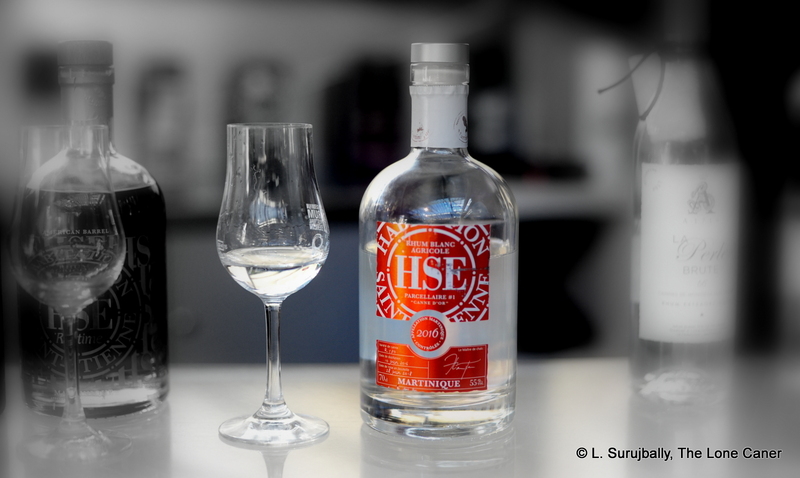 They are all branches from the same tree – hooches with boosted ester counts to make for a enormously flavourful product. And you could sense that on the nose, which was one to drive Cyrano de Bergerac into conniption fits. It lacked the smooth warmth of an aged product, but whether it did or didn’t spend time sleeping in wood, it reeked like a white monster from Haiti, even at the low strength. Olives, brine, licorice, black pepper, some vanilla, prunes and pencil shavings were immediately noticeable, in a sort of delirious free-for-all for dominance, followed by a lessening intensity over time as it opened up and provided some secondary aromas of vanilla, bags of fleshy fruits (peaches, apricots, prunes, plums, citrus), very light caramel and some aromatic tobacco. 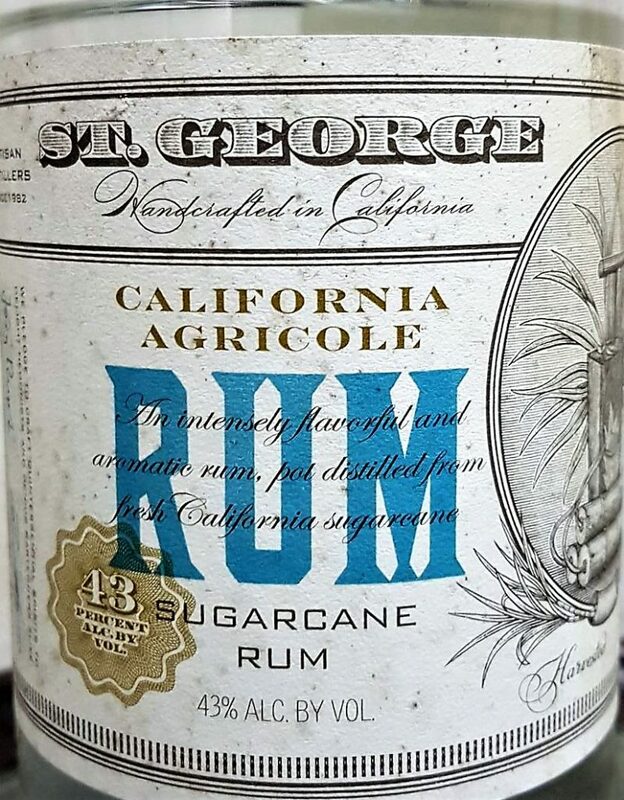 Not entirely original, but very very pungent, which for a rum issued at 43% was quite impressive – it was certainly more interesting than the light Cuban-style San Pablo or milquetoast Dictador Best of 1977 I happened to have on hand. Actually, that smell it reminded me rather less of an agricole than of a Jamaican, with all the funk and rotten bananas and midden heaps (akin to the Long Pond TECC but nowhere near as intense). The pattern repeated itself as I tasted it, starting off sharp, uncouth, jagged, raw…and underneath all that was some real quality. There were caramel, salty cashews, marshmallows, brown sugar (truly an agricole? I wrote in my notes), plasticine, wax crayons, brine, olives, sugar water, pineapple, raisins, a solid citrus heft to it, and again a lot of varied ripe fruits (and some not so ripe that were just beginning to go off). It was kind of sweet and salt and sour all at once – practically a roadmap to the esters it squirted from every pore. But what was nice about it, was that if left to rest, it turned out to be smooth enough to sip while retaining that edge of raw quality that would make it a great mixer, and it’s got all the character of profile which the San Pablo (both the Gold and the White) so conspicuously lacked. Even the finish demonstrated that – it was short, but quite intense, with lingering notes of citrus, light anise, molasses, fruits, raisins and a last hint of salt. My initial scribbles, transcribed here verbatim, read “Can’t tell what this is, need more background work. 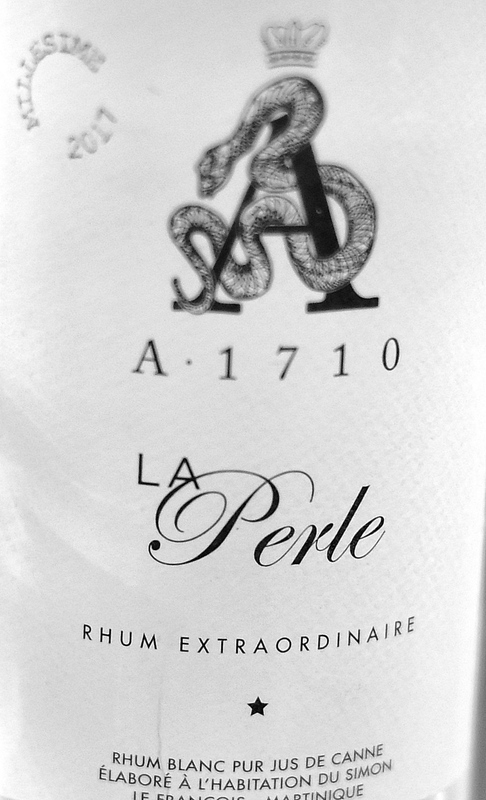 Says from Martinique, but it backs away from the crisp/clean agricole party line; seems more like a Jamaica-Martinique stepchild?” (Yeah, I really do write like that). 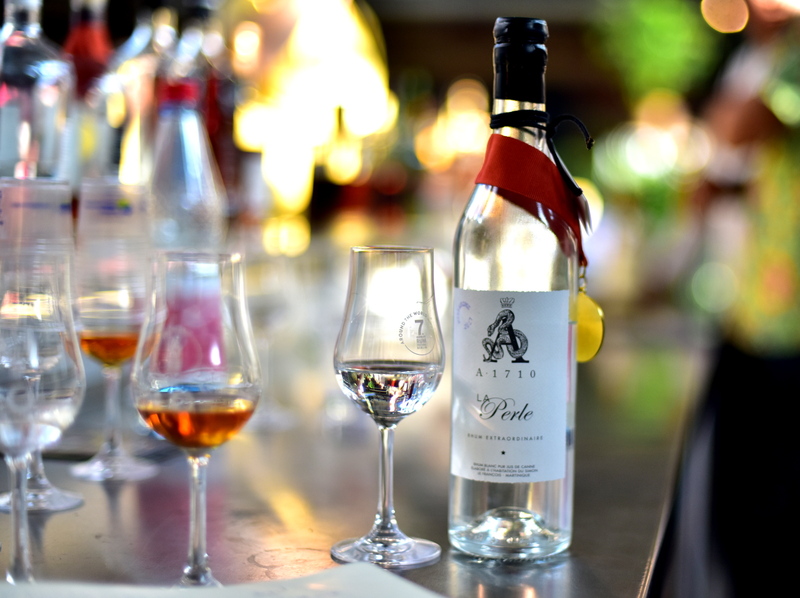 Because to me, it presented as a hybrid at the very least, suggesting intriguing paths for rum makers – a combination of agricole and molasses rum, made perhaps en passant, but certainly not lacking in brio, aggro or tempo. So what is it? 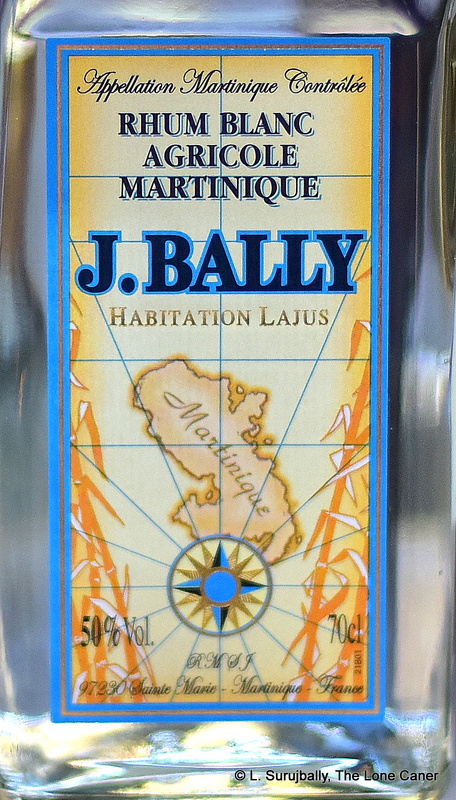 A local rum made for the backcountry and not for export? A trial balloon of sorts to suss out the market? A failed attempt at something different, an experiment that somehow got loose from the lab? A bottle of the chairman’s private stash that got smuggled out in someone’s trousers? Not quite. 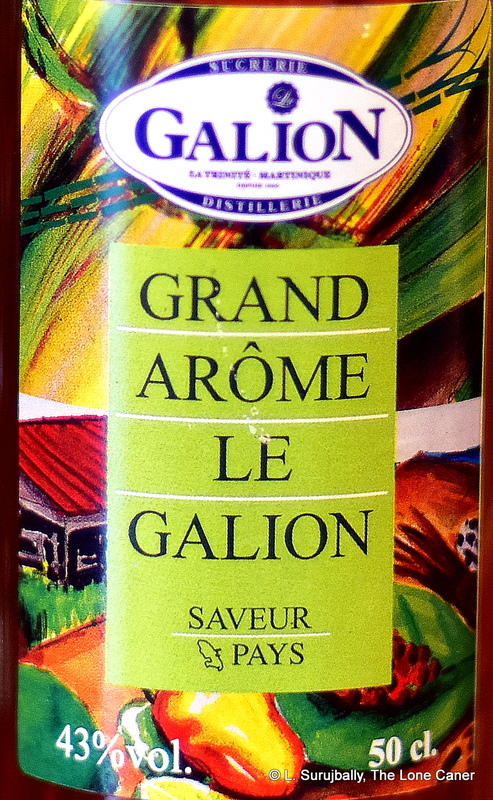 It’s Martinique’s answer to the Jamaican bad boys, made by the last remaining sugar factory on Martinique, Usine du Galion, which has the added distinction of also being the last distillery on the island to make rum from molasses (they source cane from around the island, from areas not AOC labelled). 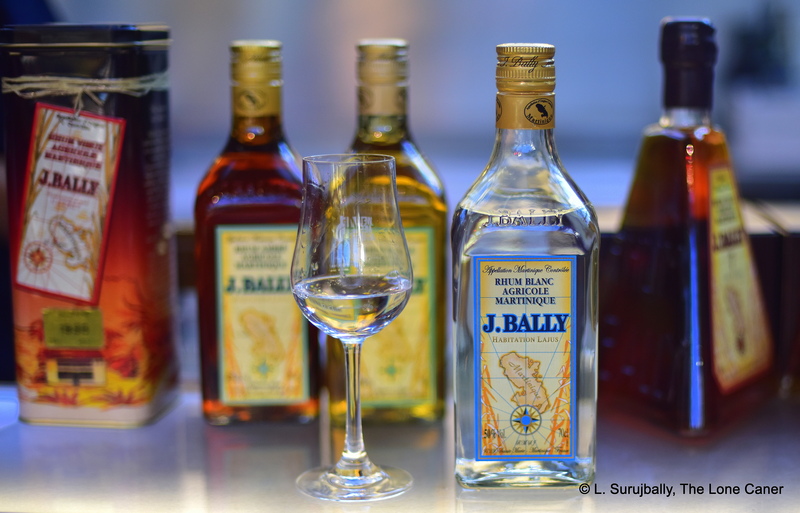 It’s mystifying why there’s such a lack of awareness of the Galion rum itself, but on reflection it’s perhaps not so surprising, because — according to the estimable Benoit Bail and Jerry Gitany who I contacted about this odd lack of profile — the commercial bottled rum is peanuts to them. Their real core business is sugar, and that part of the operation is huge, their primary focus. They installed a column still in the factory to make rum in bulk, which is then almost all exported to Europe, used primarily in the tobacco/candy/pastry industries and pharmaceuticals (probably perfumes). There are only two Galion rums I’m aware of at this point: a white I’ve never seen at around 50-55%, and this one at 43%, which, according to Nico Rumlover’s enormously informative article here, is made from molasses, fermented with the addition of vinasse for anything between eight to sixteen days in wooden vats, using indigenous yeasts in a continuous cycle through the columnar still. Apparently it is unaged, with a small amount of caramel added to give the brown colour and generally limited to the ester midrange of around 500 g/hlpa – squarely in the no-man’s land between Wedderburn (200-300 g/hlpa) and Continental Flavoured (700-1600 g/hlpa). 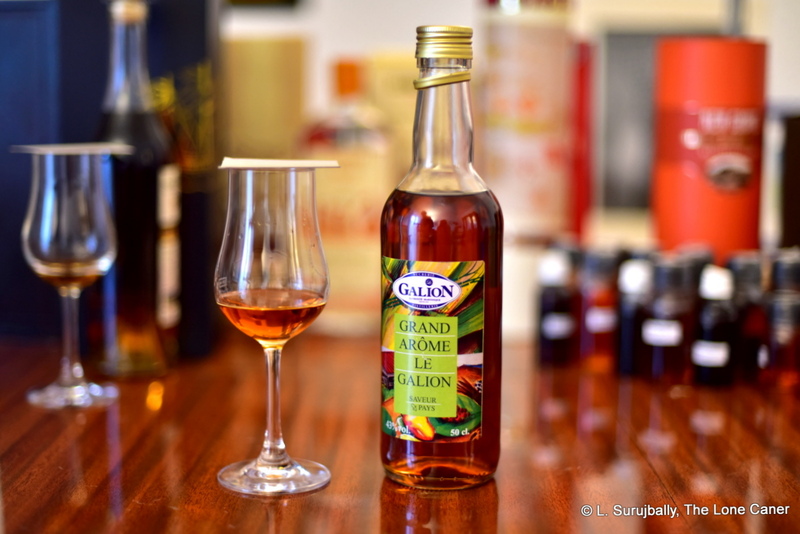 And it’s a hell of a rum, I’ll tell you that – Matt Pietrek in his article on “Beyond Jamaican Funk” mentioned Galion and what they were up to, but missed this under-the-radar rum and suggested that if you wanted French Island ester bombs, Reunion was the place to go. You might still have to, since the Galion is either available only at the factory, as a blender’s sample from Scheer in Amsterdam (at a whopping 61% ABV), or in some small, dusty forgotten shelf somewhere in Europe. But if you can pick it up, think of it as a high ester funk bomb that could be seen as a cheerfully insouciant French bird flipped at Jamaica; it proves emphatically that you don’t need to go all the way to the Indian Ocean to get yourself some, and provides a really cool comparator to those flavourful rums from all the other places we are only now getting to know so well.